I thought that it may be fun to mix the cheap(er) chic series up by focusing on home decor as well. I will still be doing a fashion oriented one during the week in the same theme as the home decor version. I thought it was appropriate to start simple with basic black home accessories. All of which are under $40! I love the black and white. And that vase is darling! Great ideas and picks - anything cheaper is great right now! 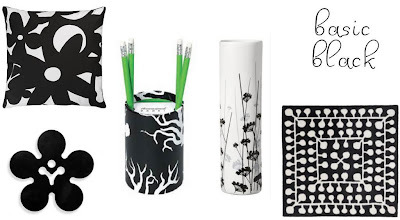 I love that vase from Target-you can't go wrong with chic black and white accessories! the vase is so beautiful, and at such a great price! Oh wow: this is great! I'm currently designing a black and white office. I think I need that rug [and possibly the vase]! What a beautiful and fun site you have! 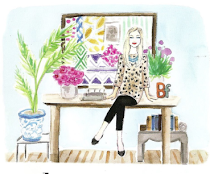 I am new to this whole blogging experience but I love your posts and I want that IKEA rug! Thanks for sharing! Oh yeah! Love these and I cant wait to see more! Great finds! I love chic and cheap. These are looking great. You may look Ballard Designs to find unique Home Accessories. Unique Home Accessories India to decorate your home in your own style.